Ashoka, the third emperor of the Mauryan Empire, erected and inscribed numerous sandstone pillars with edicts—moral principles based on the ideal of dharma (dhamma) that he had conceived—throughout his kingdom during the 3rd century BCE. 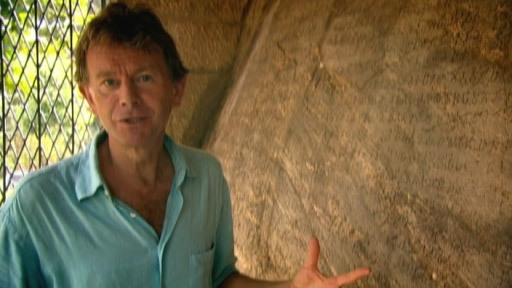 In the 19th century, scholars were able to translate the edicts, which were also inscribed on rocks and cave walls. Approximately 35 distinct inscriptions have been found, with the most important appearing in the Fourteen Rock Edicts and Seven Pillar Edicts series. In the thirteenth of his fourteen major edicts, Ashoka memorializes the Battle of Kalinga, a kingdom on the eastern coast of India. 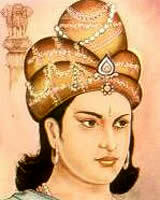 The battle and conquest of the kingdom represent a turning point in Ashoka's rule. Deeply remorseful over the excessive loss of life resulting from the battle, he converted to Buddhism and renounced war for non-violence. Ashoka also embraced religious tolerance, an idea that was to reappear in the reign of Akbar, and in the writings of Dara Shikoh. To spread the influence of dharma, Ashoka erected stupas and sent emissaries (including his son, a Buddhist monk, who traveled to Sri Lanka) abroad to countries including Greece, Syria and North Africa. This Ashokan Pillar is one of several free-standing, highly polished sandstone pillars from the reign of the Mauryan Emperor Ashoka found across northern India. 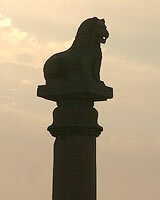 The tall, heavy column isn't supported by a base or platform and is crowned by a capital with a single lion. The authoritative, open-mouthed lion is seated on a square dais that juts from the capital's base, which is decorated with an inverted lotus blossom. Similar to other pillars that have been discovered in the region, it is made of a single piece of light colored sandstone and transported from a quarry in Chunar, near Varanasi (Benares). The pillar, erected by Ashoka in Kolhua near a brick stupa (a domed memorial for the Buddha) and the ruins of a Buddhist monastery, commemorates the last sermon of the Buddha before he achieved enlightenment. Its lion capital faces north, the direction the Buddha took on his last voyage. Only ten pillars with intact inscriptions have been found, although many more were erected during the emperor's reign. The inscriptions describe edicts of ethical conduct, public and private, based on non-violence and the tenets of Buddhism, that were created and promulgated by Ashoka. The Battle of Kalinga, an east coast kingdom in modern Orissa, marked a turning point in the rule of the Mauryan emperor, Ashoka the Great (c. 269–233 BCE). In about 261 BCE, Ashoka fought a bloody war for the kingdom, a conquest he records in the thirteenth and most important of his Fourteen Rock Edicts. In the edict, he numbered the conflict's casualties and prisoners at more than 200,000 and expressed remorse for this massive loss of life and freedom. He renounced war for conquest through righteousness, dharma: "They should only consider conquest by dharma to be a true conquest, and delight in dharma should be their whole delight, for this is of value in both this world and the next." Dharma became the organizing principle of Ashoka's personal and public life and shaped his policies of non-violence and religious tolerance. Buddhism is a religion or philosophy founded in the 5th century BCE by Siddhartha Gautama, the Buddha, born a prince of the Shakya clan in northern India. 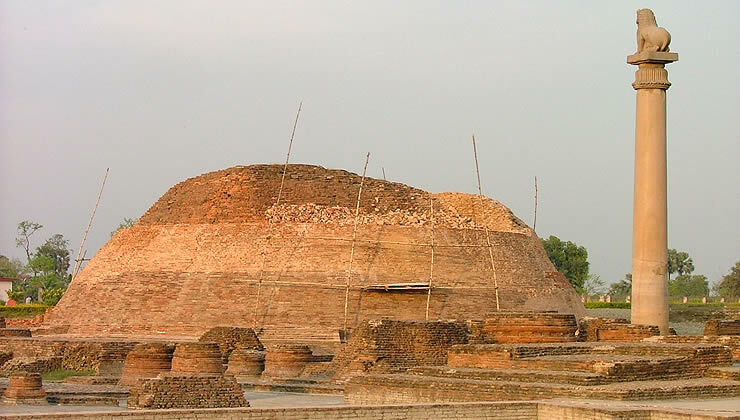 Much controversy surrounds the Buddha's birth and death, or parinirvana (the reaching of nirvana); the traditional date of his death is 486 BCE but some believe he was born sometime in the mid-fifth century BCE and died at Kushinagar between 400 and 350 BCE. The Buddha, the Buddhist community, and dharma (or religious law), are considered the Three Jewels of Buddhism. The first of Four Noble Truths that Buddhism teaches is that all life is suffering (dhukka). Siddhartha arrived at this truth by observing disease, illness, suffering, and death in the forms of an old man, a blind man, a dying man, and a corpse. On a quest to find a way to break free from this suffering, Siddhartha left his wife and child to become an ascetic, traveling across the Magadha kingdom in northeast India and studying under a number of teachers. How to liberate the self from a constant cycle of birth and rebirth, or samsara, was his principle question. After six years of wandering, he found his answer and attained enlightenment while meditating under a tree in Boghgaya. The Buddha's insights are crystallized in the remaining noble truth—that suffering is caused by desire (trishna); that suffering can be overcome; that by following the Eightfold Path (imagined as a cyclic Wheel of Dharma), individuals can become free of attachment and reach nirvana. The Eightfold Path includes living with right understanding, thought, speech, action, livelihood, effort, mindfulness, and concentration. He also advocated living according to the "Middle Way," a path between severe asceticism and heady indulgence. The Buddha lived the remaining 45 years of his life after enlightenment as a wandering ascetic, delivering discourses and gaining followers, among them Magadha's king Bimbisara, who became a patron and provided generous donations including a monastery at his capital, Rajagaha (found in what is now the Indian state of Bihar). Buddhists currently number around 400 million worldwide, and the philosophy's two major traditions are Theraveda—practiced primarily in Sri Lanka, Burma, Thailand, Cambodia, and Laos—and Mahayana—practiced chiefly in China, Tibet, Japan, and Korea. Wesak, the celebration that marks the Buddha's birth in May, is the most important Buddhist festival. Dara Shikoh (1615-1659 CE) was the eldest son of the Mughal emperor Shah Jahan and his favorite wife Mumtaz Mahal, both of whom are entombed in the Taj Mahal. When Shah Jahan suddenly fell ill in 1657, Dara was the presumptive heir to the Mughal Empire, but his brothers, Murad, Aurangzeb, and Shuja, did not recognize his suzerainty and began a battle for succession that lasted two years. The ultimate victor was Aurangzeb, who first defeated Dara’s forces in Samugarh (near Agra), in 1658, when he was allied with Murad, and then killed Murad before dealing Dara’s army the final blow at a battle in Deorai (near Ajmer) in 1659. Dara had eluded capture after both confrontations, but was ultimately betrayed and turned over to Aurangzeb. Dara was set atop an old elephant and paraded through the streets of Delhi in rags and chains before being murdered in prison. Like his great-grandfather Akbar, Dara was a patron of the arts whose intellectual and spiritual curiosity led him to seek out the teachings of faiths other than his own. He was a disciple of the Sufi Qadiriyyah order, but also held discussions with Hindus and Christians. Dara wrote several works on Sufism and translated the Bhagavad Gita and some of the Vedas and the Upanishads from the original Sanskrit into Persian. His most important treatise was Majma ul-Bahrain (The Mingling of the Two Oceans), in which he argued that the essential nature of Hinduism and Islam are the same. This idea, heretical to most Muslims, then and now, led to his being officially branded an apostate by the Mughal court. A stupa is a freestanding, dome-shaped mound, often containing sacred relics. Stupas were initially built to store the cremated remains of the Buddha. Over time, they were also constructed to house the remains or cult objects of holy personages or to commemorate locations sacred to Buddhism. Early stupas consisted of a hemispheric mound of burnt bricks set on a circular or square base, accessed by a set of short steps. Atop the mound was a shaft or pillar (yasti), surrounded by a square railing, and covered by a chattra (circular or umbrella-shaped canopy). At ground level, the stupa was ringed by a pathway used for circumambulation and typically enclosed by a railing (vedika). The railing included gateways at the four cardinal points. The stupa's design evolved over the centuries to incorporate elaborate and decorative elements, such as multiple chattras, independent sculptures, and carved panels that depicted events from the life of the Buddha. 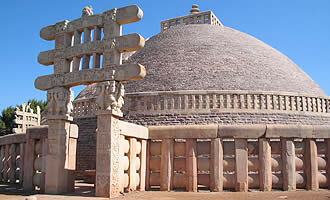 Among the most ancient and prominent Buddhist stupas in India are the Great Stupa at Sanchi and the Bharhut stupa, in Bharhut, Madhya Pradesh; the Dhamek Stupa in Sarnath, Uttar Pradesh; and the Amaravati stupa, in Amaravati, Andhra Pradesh. The current structures at all these sites are enlarged, embellished or rebuilt versions of the stupas originally erected by the Mauryan emperor Ashoka during the 3rd century BCE. 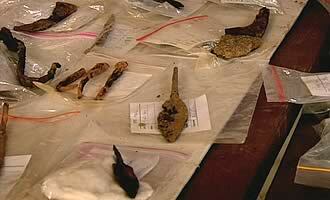 In 2005, archaeologists unearthed the remains of ten stupas he built to mark the Buddha's visit to Kalinga, in Orissa. Jains also had a tradition of building stupas, but the structure remains the iconic monument of Buddhism, which retained its significance and was propagated as the faith spread from India across Asia. 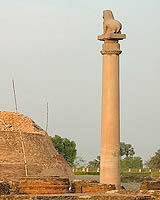 What purpose did the Ashokan pillars play during Ashoka's rule? Why do you think they would have been effective? How did the possible meeting between Alexander the Great and a young Chandragupta influence the development of the Mauryan Empire? In light of India's many religious traditions, why do you think Buddhism suffered a sharp decline in India after Ashoka? What teachings of the Buddha are most relevant in today's world?